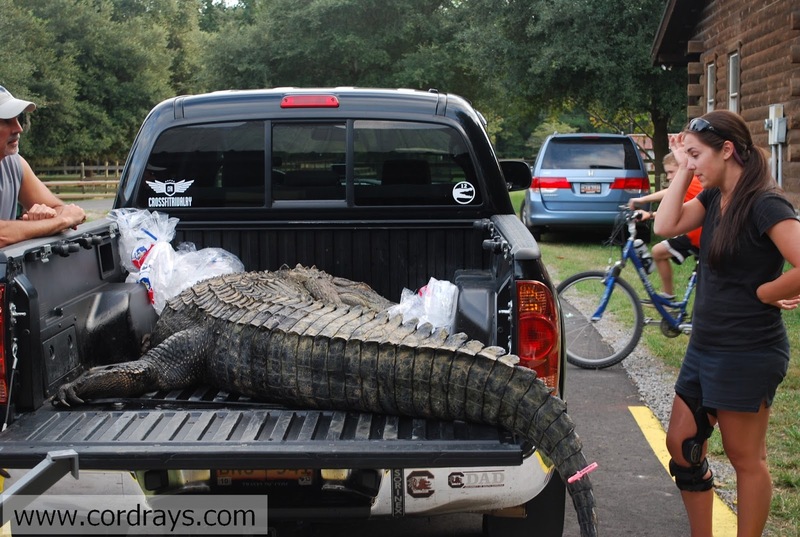 Meredith Rowe got this one! 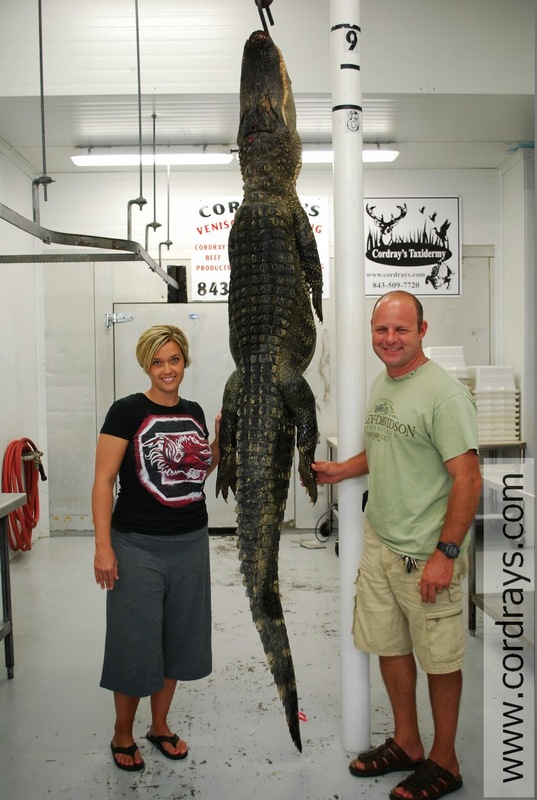 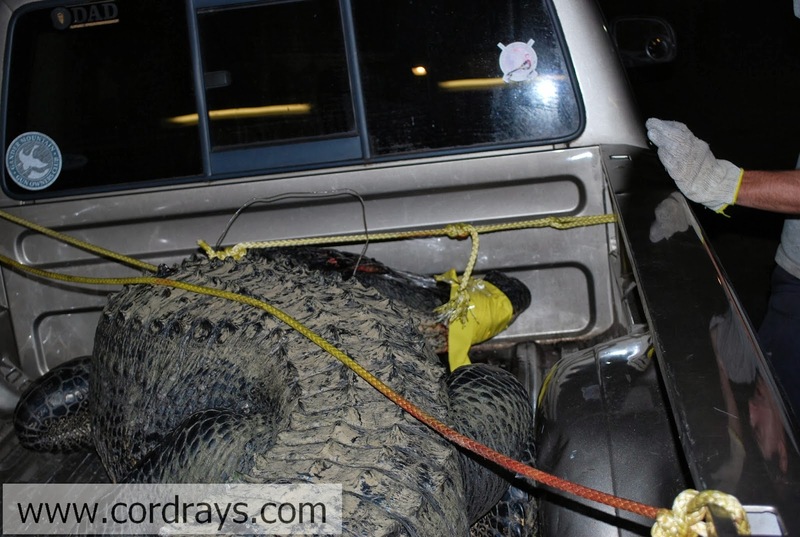 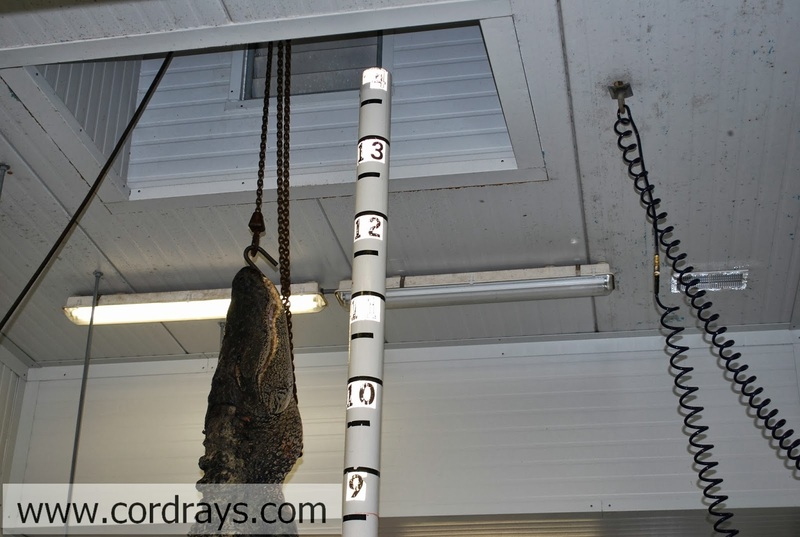 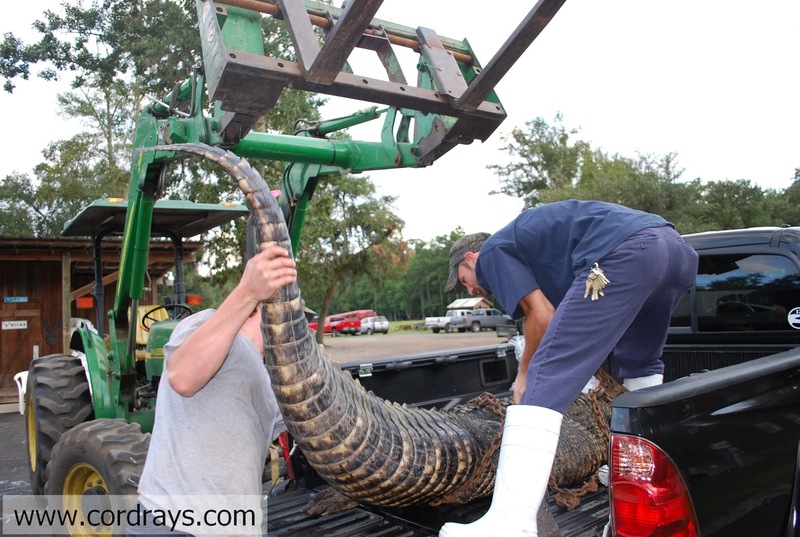 Candace Davis got a 9 foot alligator that weighed 171 lbs. Matthew Bloomer and his buddies got an 11.5 footer weighing 410 lbs. Butch Bazzle got his first and second deer tonight and got dunked by Cody and Jessie Bazzle! 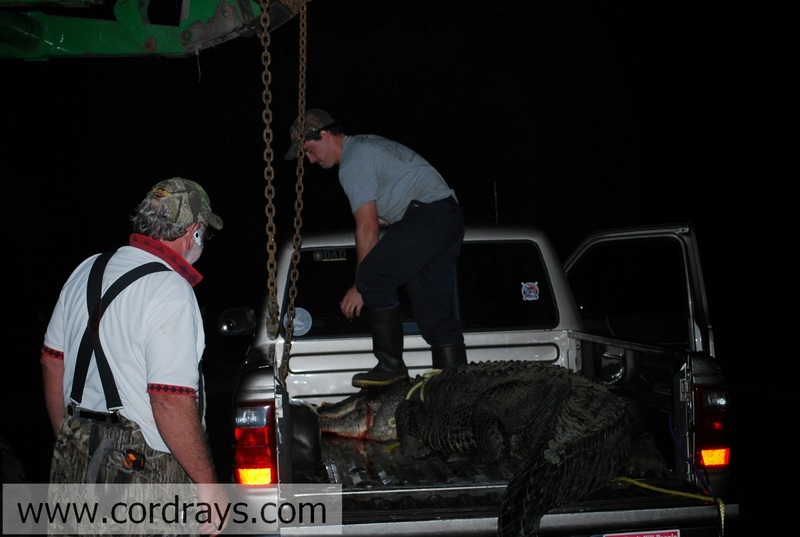 Jay Wooster brought in a BIG buck tonight! Kelsey Pritchard was understandably happy over her 10 point! 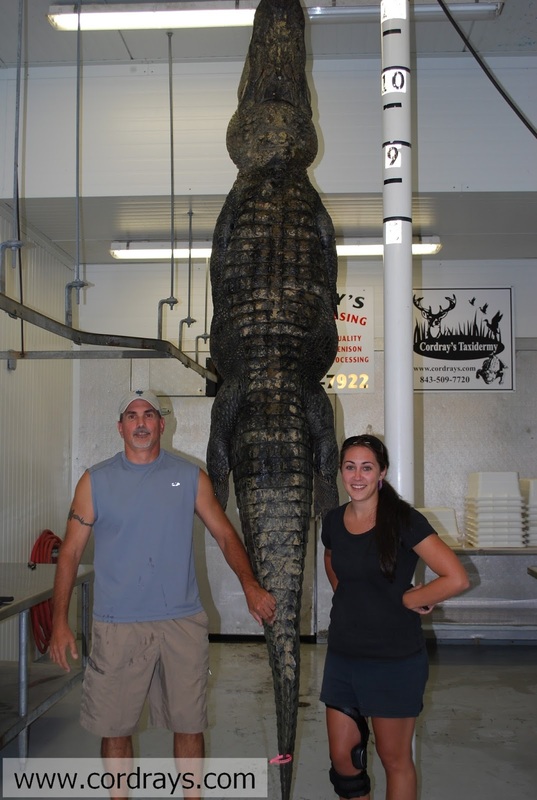 Kevin Taylor had a beautiful 9 point! 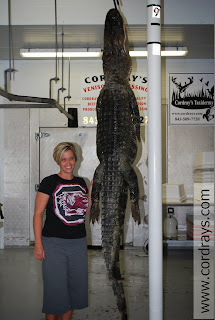 Kathryn Lucas is all smiles! Jerry Zajaczek got this big boy! 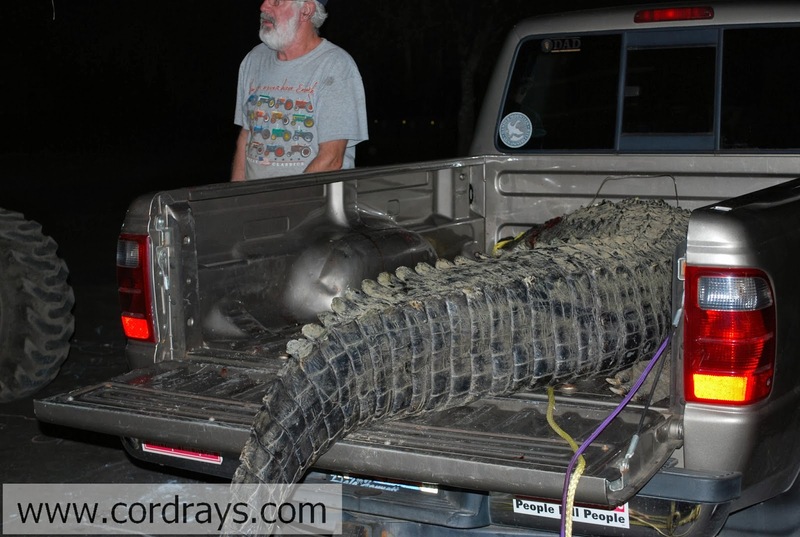 Jerry was on the TV report yesterday, too. 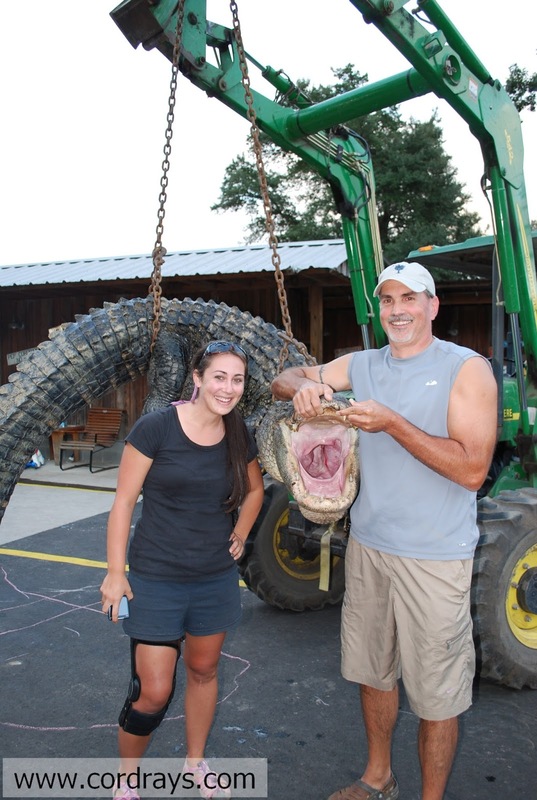 And his wife, Amanda Pulliam-Lotito, got an even bigger one! 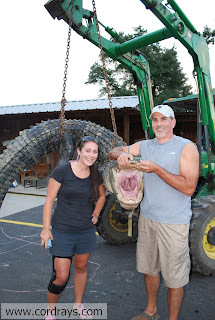 Chris Lotito got a big one! 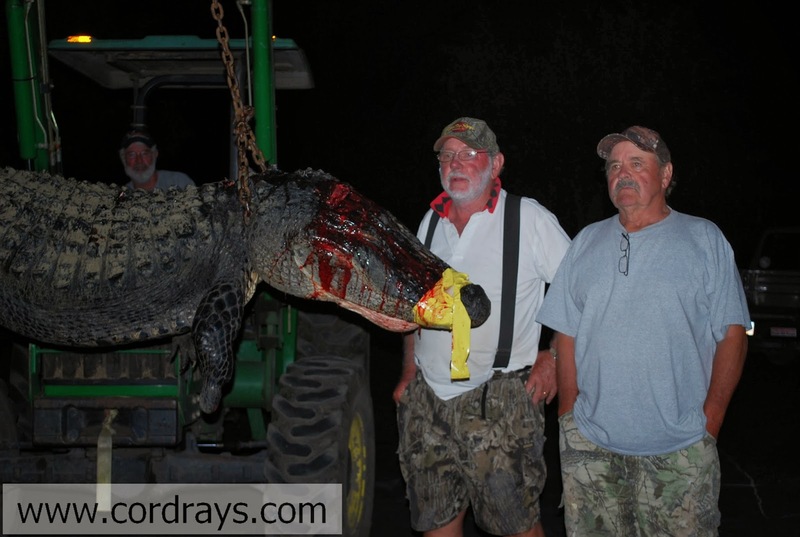 Donnie Williams and Ralph Campbell made the TV but here's a few more with their BIG gator! 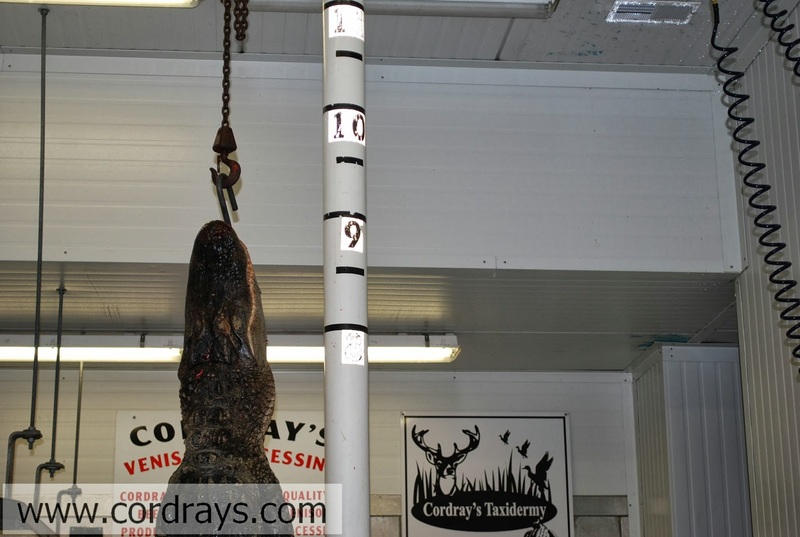 Jack Meeks brought in a 9 point weighing 128 lbs. 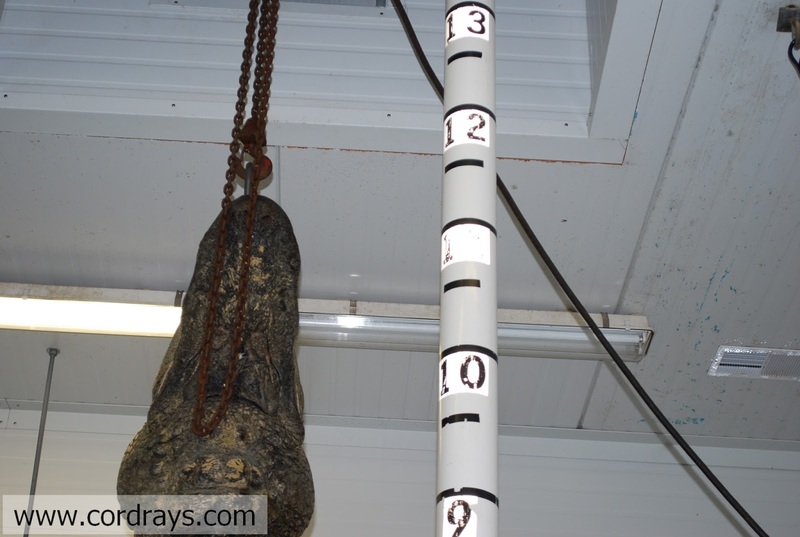 Bubba Bair's buck had 11 points! Conley Bryan brought in an 8 point! Watch the video from Live 5 News on the story behind the two big gators we had yesterday! 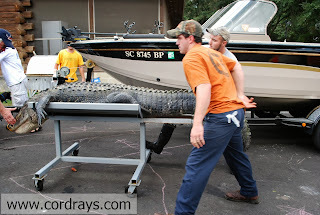 Donnie Williams and his buddy, RalphCampbell, got the surprise of a lifetime! 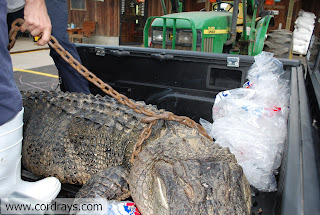 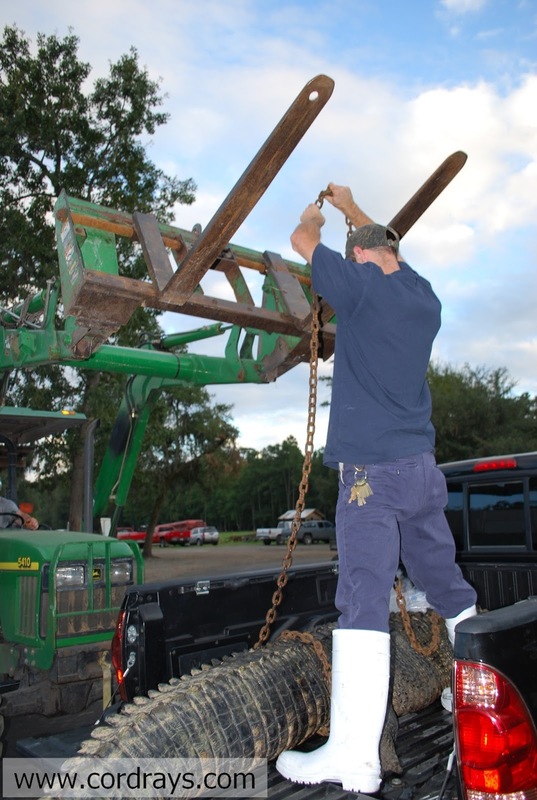 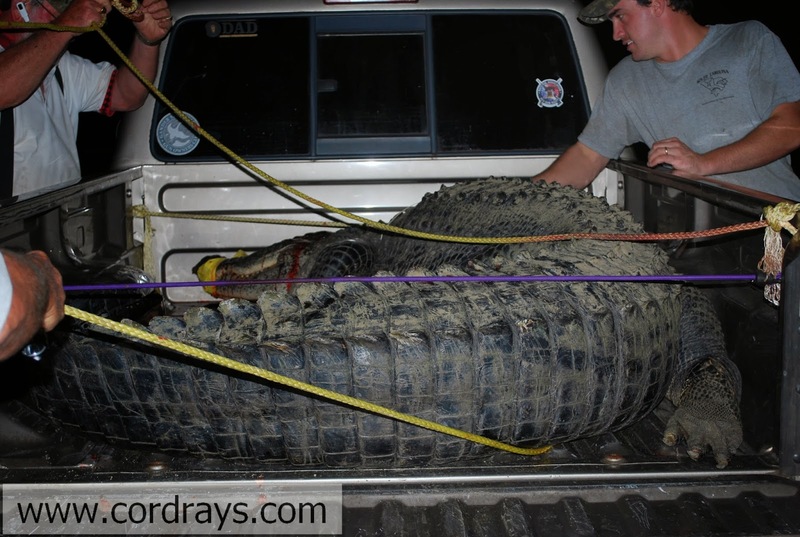 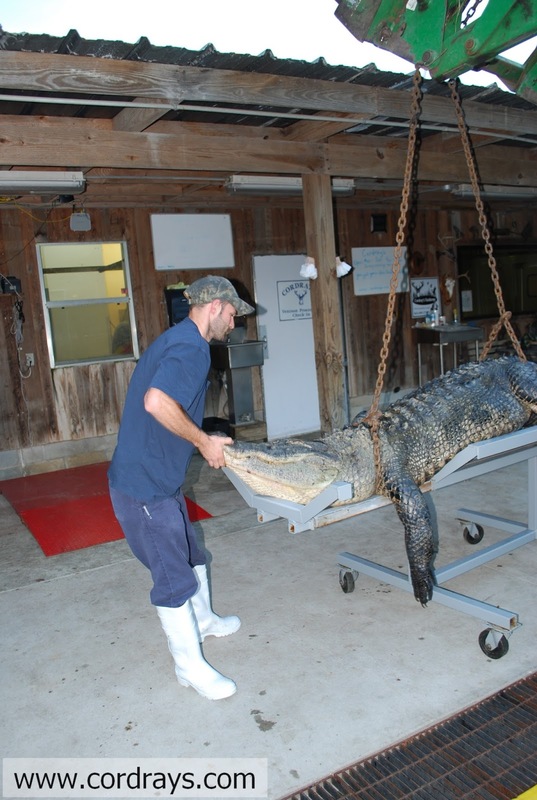 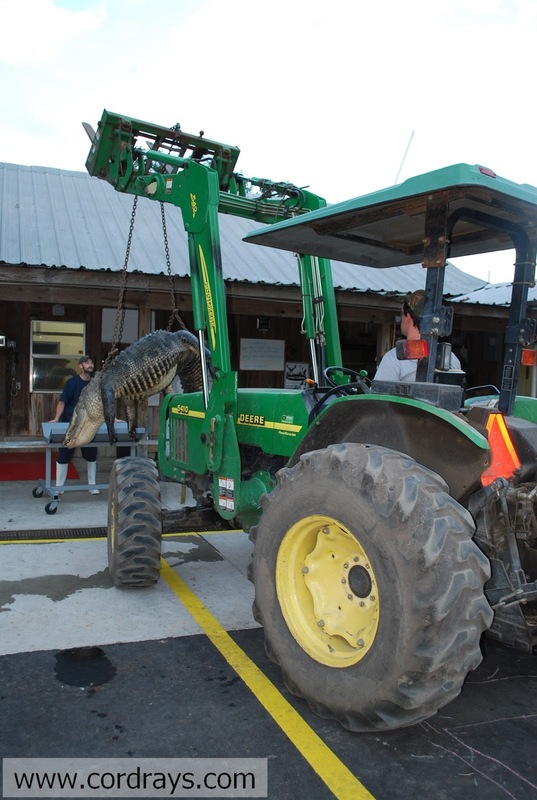 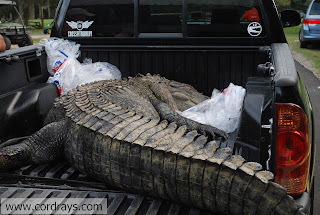 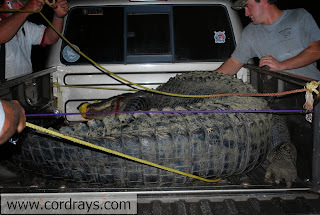 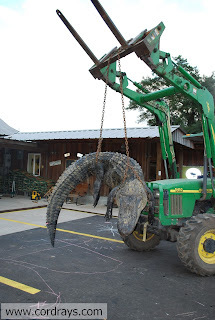 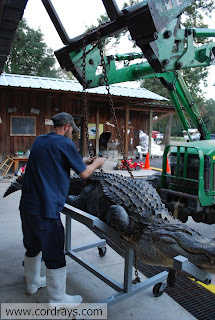 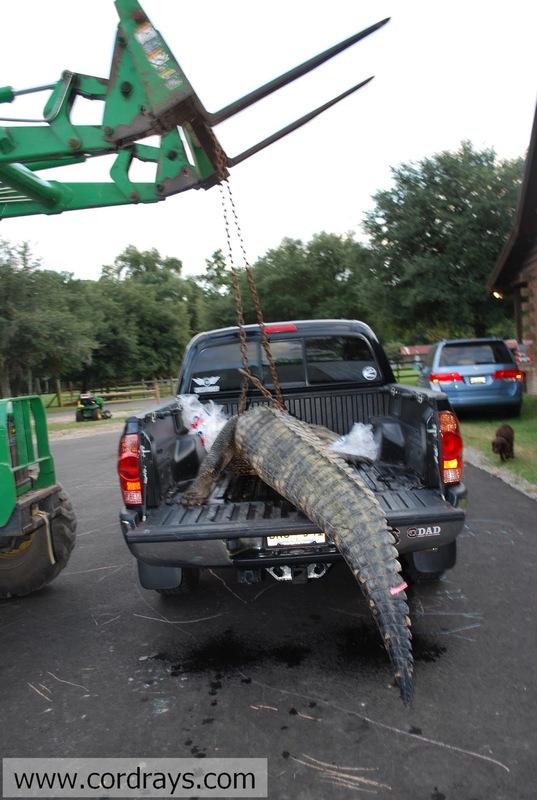 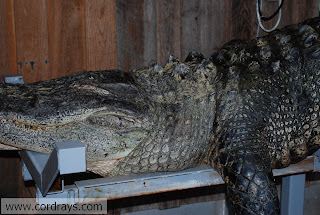 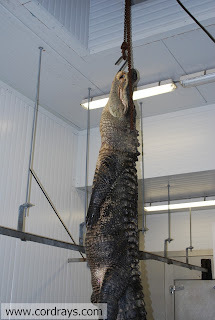 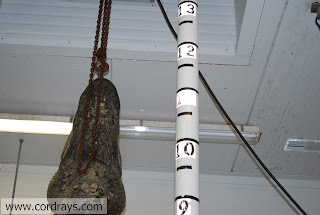 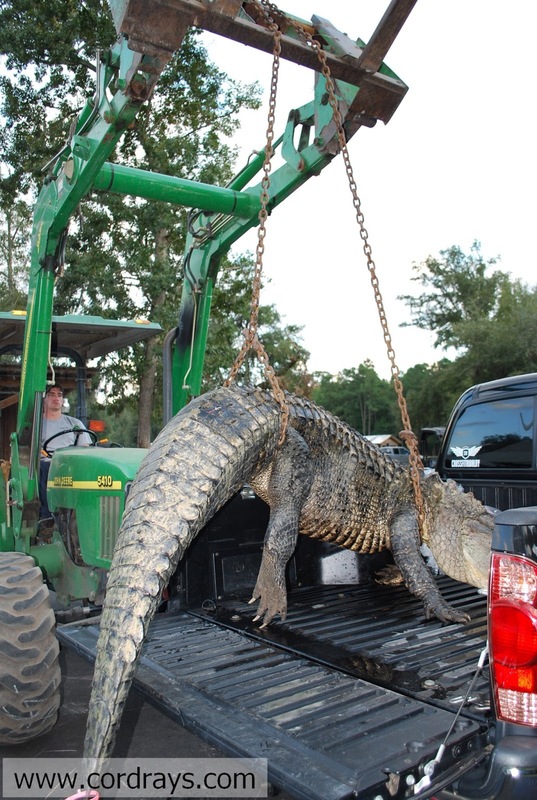 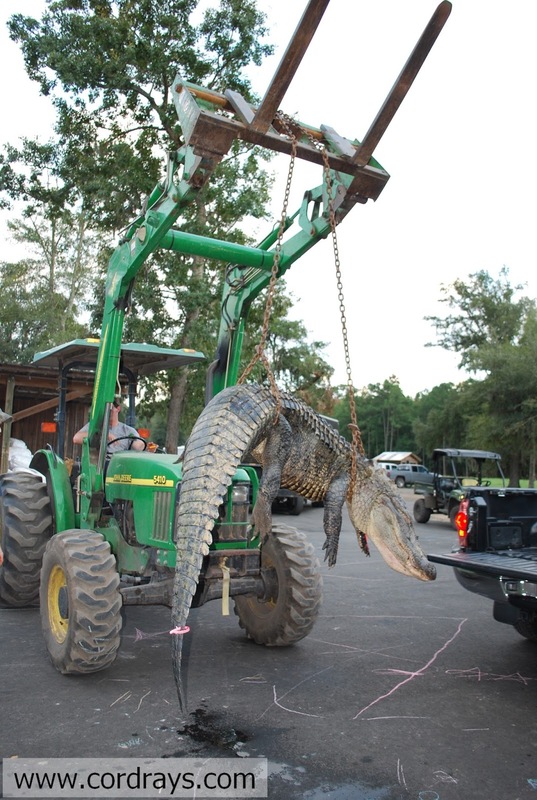 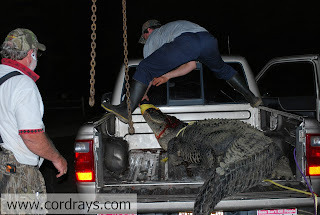 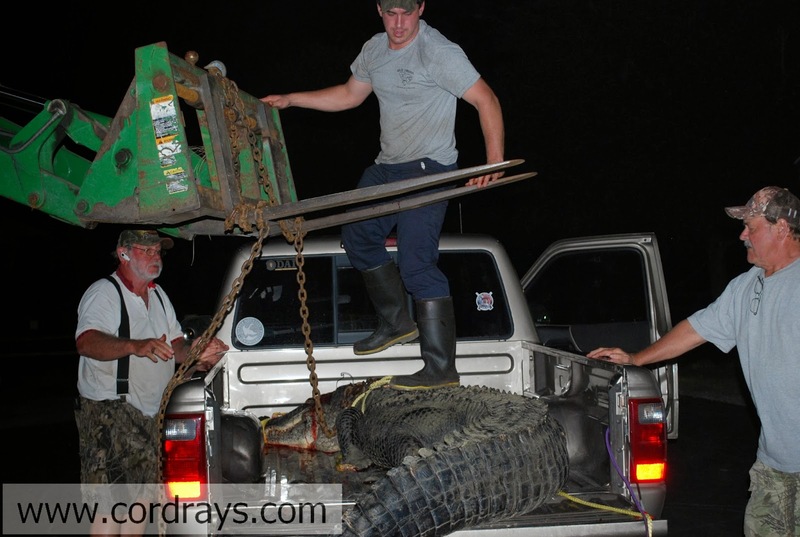 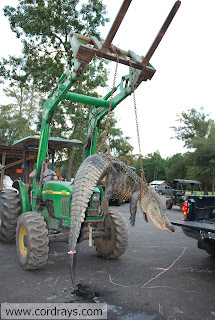 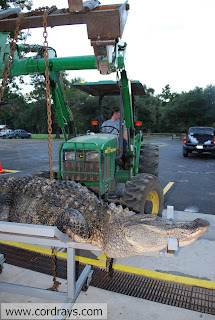 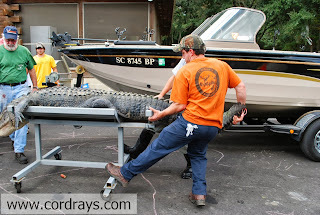 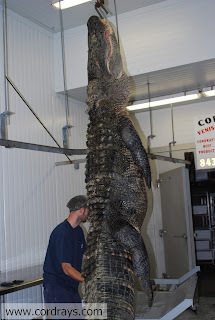 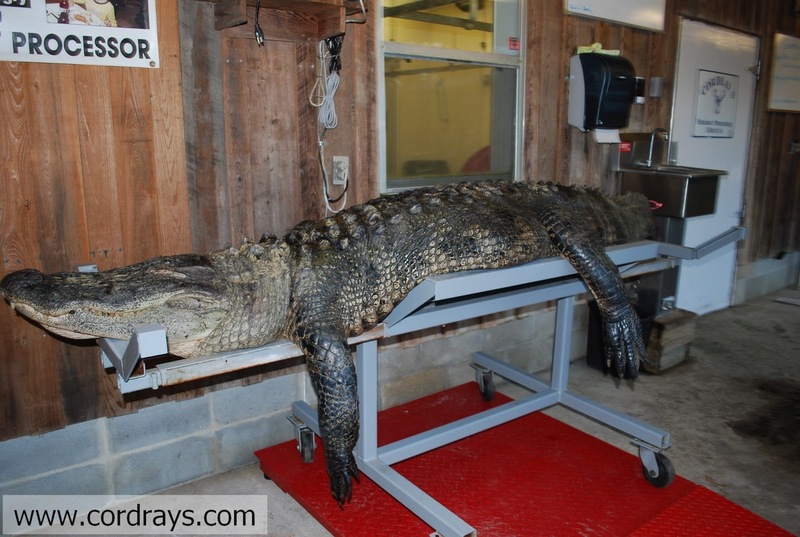 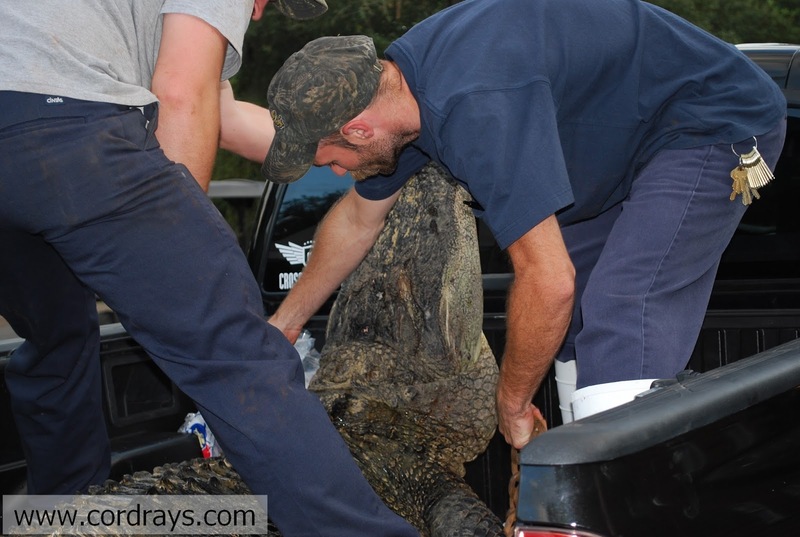 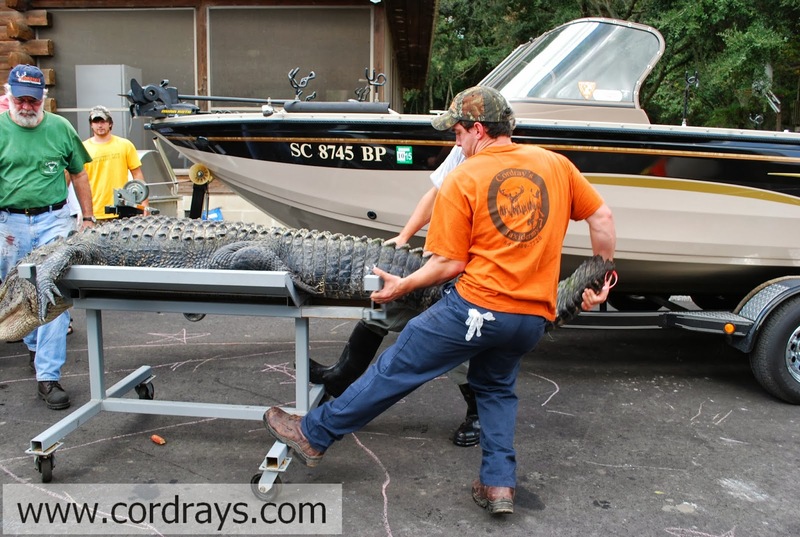 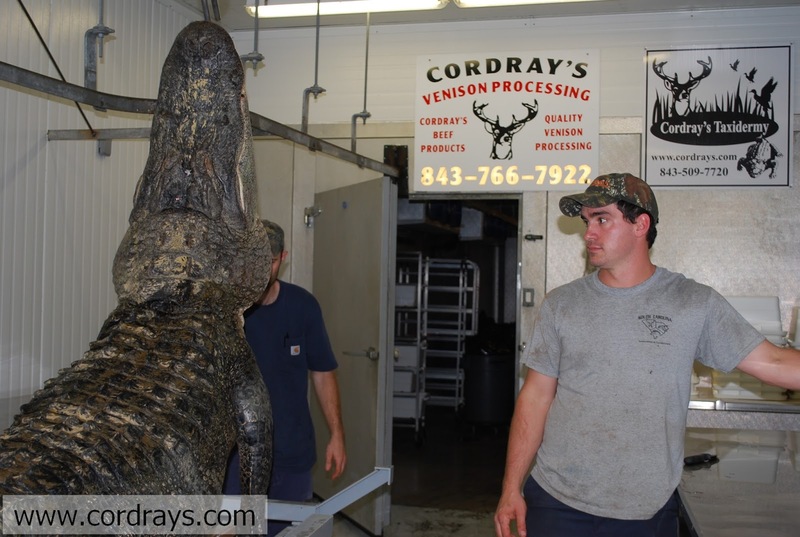 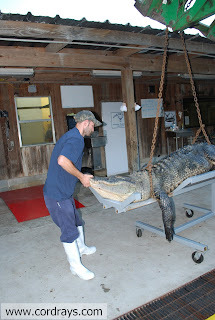 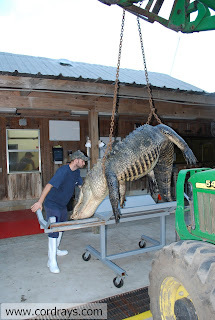 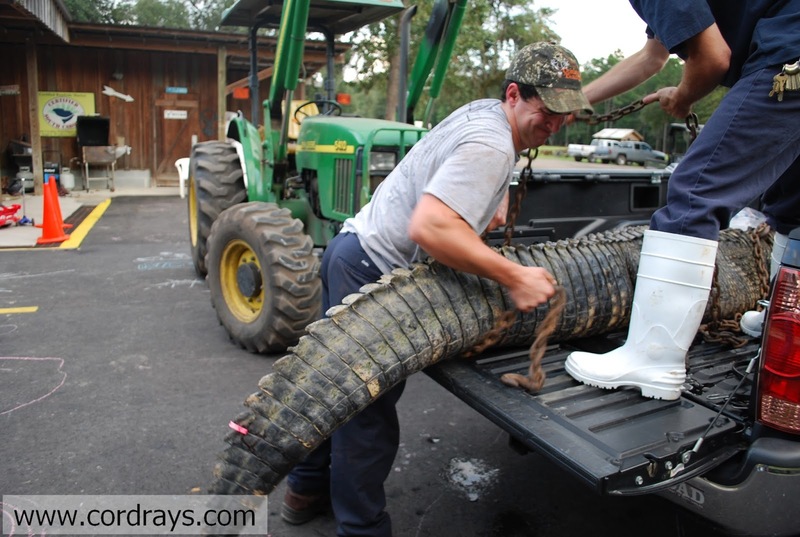 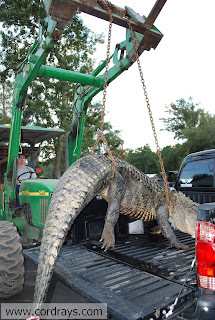 His gator weighed 575 lbs and was over 12 feet long. 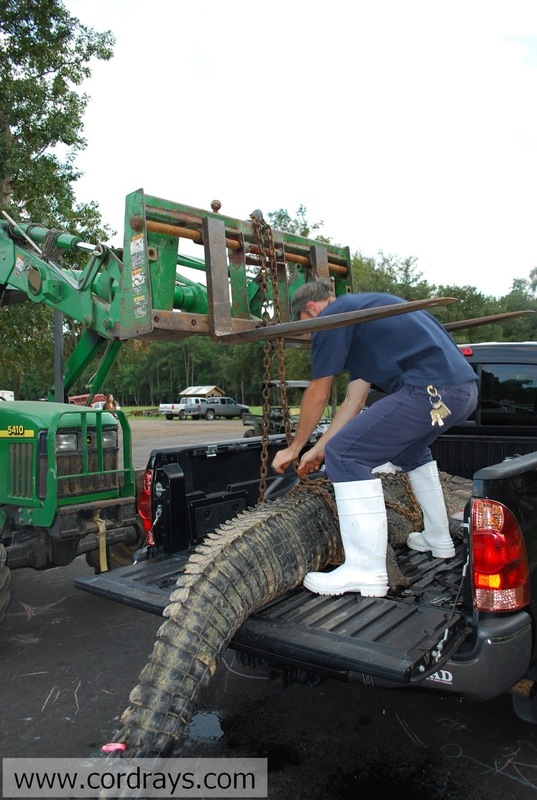 Live 5 News talked with some of our alligator hunters today. Watch the 7 o'clock news! 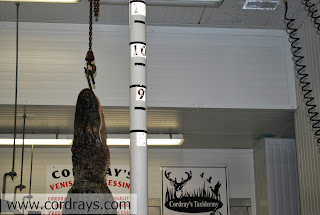 Felicia Wheeler got her first deer with Bryan O'Neil and got dunked to join the Cordray's First Deer Hall of Fame! 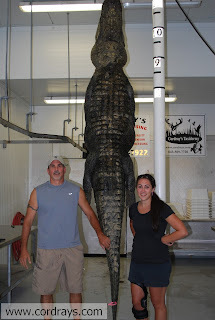 Kerry Quillen and his daughter Sarah Silkwood brought in this 11 footer weighing 500 lbs. 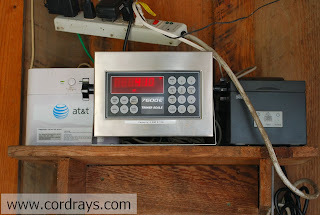 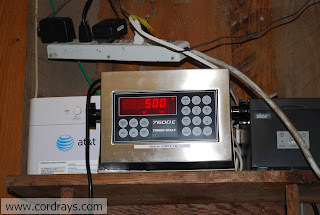 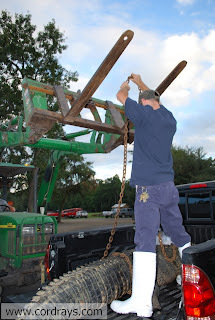 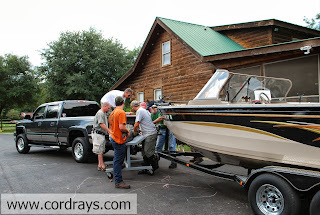 Here's the whole story of how you get a 500 pounder unloaded! See the sticker in the window? 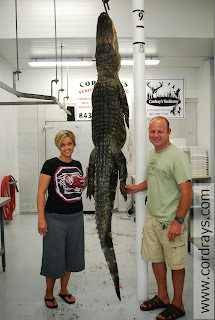 These folks are repeat customers. 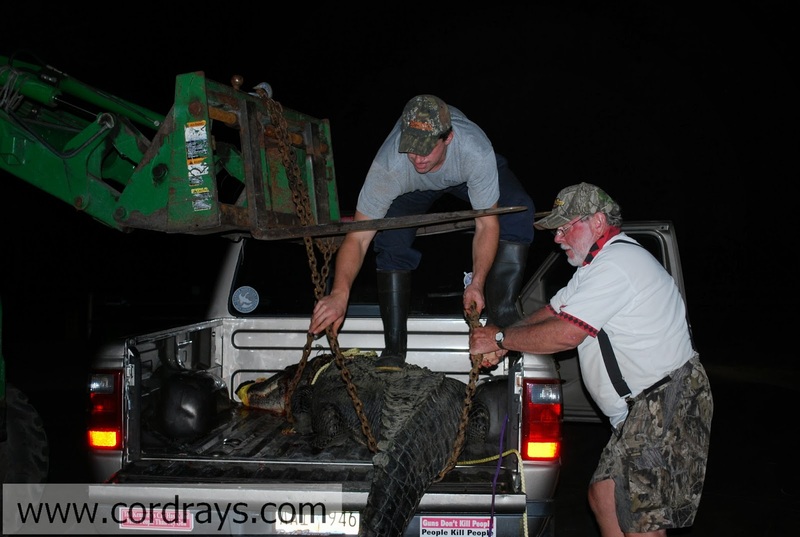 Joseph Martin helped Kenneth get his hooked up for transport. 500 pounds on the nose! Thomas Rehm got this nice buck last night. 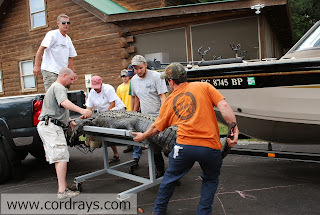 Bryan Hart brought in a 10 footer! 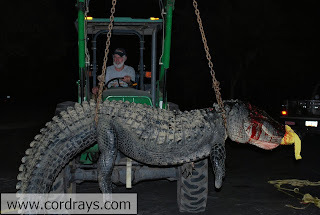 Timmy Motte got a nice 10 point tonight! 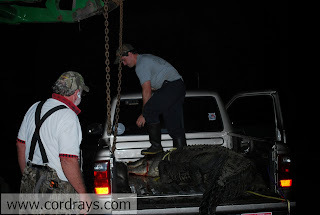 JJ Outen got this BIG pig! 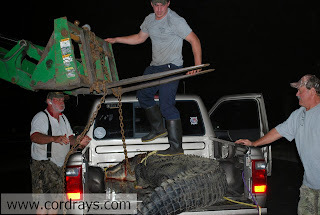 Harrison Pritchard put up a fight!